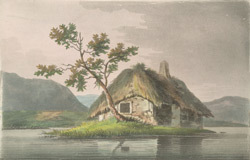 View of a cottage in North Wales. In the mid 18th century Wales was still predominantly a rural country but the Industrial Revolution transformed the landscape and helped stimulate a large population growth. The cottage in this picture is typical of those built around this time to accommodate this growing population. Cottages were built wherever land could be found – even on common land and the verges of roads. Tenants believed that if a house could be built in one night and have smoke rising from the chimney by morning, the house and the land around it rightfully became their property. Thus cottages were built with whatever materials could be found- turf and stone for the walls and a thatched roof.